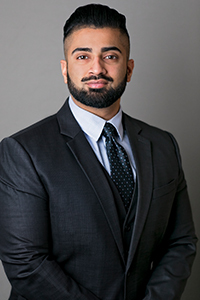 Mikhail A. Shah concentrates his practice in state and federal court litigation, including the prosecution and defense of personal injury, medical malpractice, and commercial matters. Prior to joining Girvin & Ferlazzo, Mikhail was an associate with an Albany, New York, law firm where he was a member of the Litigation and Environmental and Land Use Practice Groups. While there he concentrated his practice in civil litigation as well as the representation of clients in land use and zoning matters, municipal liability issues, and medical malpractice and personal injury claims. Mikhail earned his Juris Doctor from Albany Law School, where he served as the President and Director of the Albany Law School Pro Bono Society. During law school, Mikhail also clerked at two large international law firms, competed in the Karen C. McGovern Senior Prize Trials Competition, and served as a Judicial Intern for the Honorable Judge Mae A. D’Agostino at the United States District Court for the Northern District of New York. Prior to attending law school, Mikhail received his Bachelor of Science in biological sciences from George Mason University.